Economy round trip from only 420 eur, book now! Shanghai, a city with limitless possibilities and endless opportunities. Come and see for yourself why global elites, young fashionistas and traditional craftsmen alike choose Shanghai as their go to destination and experience the most dynamic and exciting city in all of China. 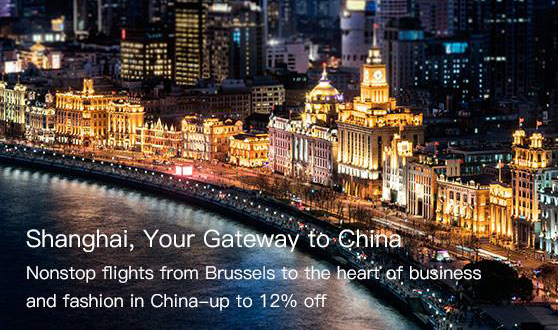 Hainan Airlines is adding a direct flight between Shanghai Pudong Airport and Brussels Airport three times a week. The flights are scheduled on Monday, Wednesday, Friday and will be operated by a Dreamliner 787-9, with 30 seats available in business and 258 in economy class. Hainan Airlines launched brand new Prime Wings Lounge located in Terminal 2, Beijing Capital International Airport. This flagship lounge of Hainan Airlines is able to accommodate 148 air passengers. Covering 726 square meters, it is home to more than 10 function areas, such as the tea area, lounge area, reading room, VIP room, sleeping area, bath room, audio and video area, etc. The brand new Prime Wings Lounge will provide passengers a space to rest and refresh in this extremely busy hub. Hainan Airlines ‘ promotion return fare from Brussels to China main cities: Beijing, Shanghai, Guangzhou, Shenzhen, Hangzhou, Ningbo, Xiamen, Fuzhou, Chengdu, etc starts from only €450. 1. Fares shown includes taxes and fuel surcharges. (Route origin PEK is not available). 4. Fare is subject to seat availability. 5. Special fare restrictions may apply. Enjoy a premium, seamless travel experience with Hainan Airlines with upgraded travel services ranging from priority check-in and boarding to exclusive onboard catering provided by Michelin star Chefs. In addition, we have recently completed high-end renovations on our premium HNA Club Lounge at Beijing Capital Airport and are welcoming all Business Class Passengers to enjoy our new luxury lounge space. From May 16th and May 23th, passengers can enjoy an 8% discount when booking Business Class tickets on this page. Fortune Wings Club members can enjoy a 10% discount. This offer applies to all Hainan Airlines operated flight routes, including Shanghai, Tokyo, Bangkok and many, many more! 1. The offer is applicable for all HU international flights, except for chartered airplane flights and code sharing flights. 2. Fortune Wings Club Members need to sign in on this page before booking tickets to take advantage of 10% discount. Two or more people travel together with Fortune Wings Club member are subject to enjoy same discount. 3. Fortune Wings Club member will enjoy up to 20,000 Bonus Points by registering on page of “Earn Bonus Points”. Bonus points will be credited to your account no later than 2 weeks after the departure of your flight. 4. The discount of this offer is based on ticket price only, taxes fees and carrier charges not included. 5. In case of rebooking/reissue, a booking service charge and the price differences that may occur will be charged to you. The discount you got in this offer will also be applied. 6. Child fare is 75% of the adult fare; infant fare is 10% of the adult fare. No more discount applies. 7. For flights from European to Chinese mainland, passengers will enjoy an extra free baggage allowance. 8. Hainan Airlines reserves the right to modify or renew the above Terms and Conditions regarding the use of this website. To translate or to interpret is more than to render a text or a speech from one language to another. A professional translator needs also to convey the essential meaning and spirit of a text or a speaker. Except for language fluency, experience in interpreting and translation, good understanding of both cultures, various background knowledge, and quick reflexes are the fundamental skills for a professional translator. For over 2 decades of experience in interpreting and translation in various fields of business and commerce, ChinAccess has succeeded to integrate these skills into the interpreting and translation techniques. The motto of ChinAcces is to strive for quality and trustworthiness.